This was taken at our final combined birthday party, just before the last round of chemo. 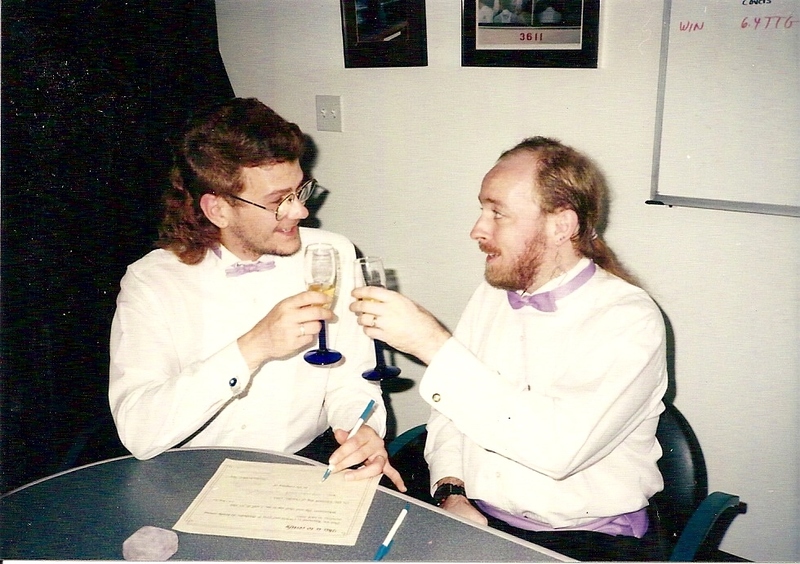 Twenty years ago today I had to sign some papers. Then a couple of nurses turned off the monitors, removed the respirator tubes, and turned off the rest of the machines. I’d been crying off and on for hours—days, technically (though I’d only slept a couple hours out of the previous 59-ish, so it seemed like one really long, horrible day). My last chronologically-in-order memory is taking hold of his hand that one last time. My memories for the next few months are like the shards of a thoroughly shattered stained glass window. When we had our commitment ceremony several years earlier, he promised me he would stay with me for the rest of his life. I consider myself indescribably lucky to have had that kind of love in my life. The fact that after Ray’s death I later met and fell in love with another man does nothing to reduce the sense of loss I feel when I think about Ray. Ray unpacking after we moved into our second apartment. 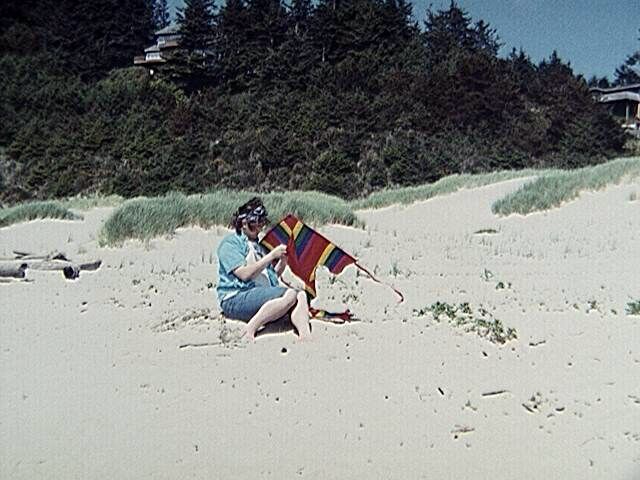 My friend Kristin sent me this picture saying, “How I like to remember Ray.” This was a trip we all took to the beach. He’s prepping his kite for launch. Signing papers after our commitment ceremony. 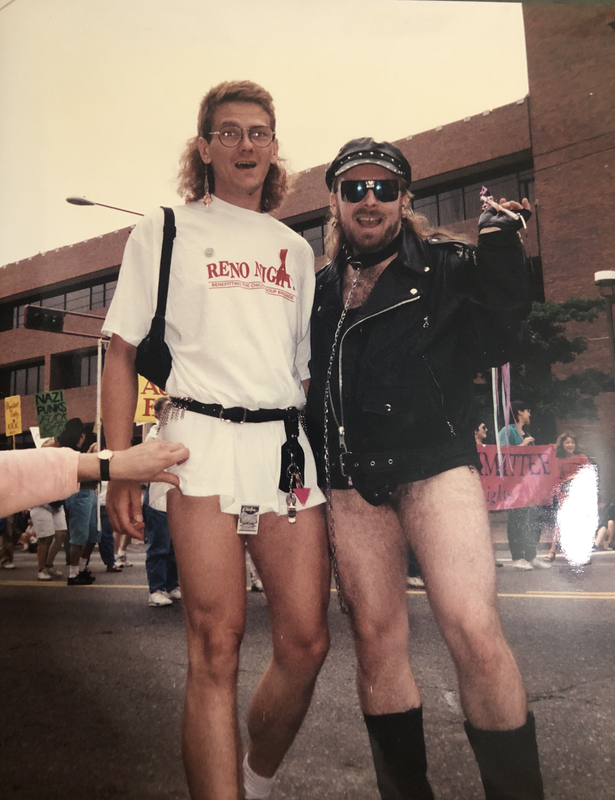 Ray and I at the Pride Parade sometime in the early 90s. Nice outfits! I think I remember the 90s, but not all that sure except for the lavish leather and studs and lace look.